When Robert Aickman nominated his seven wonders of the waterways, he went for a real mixed bag. 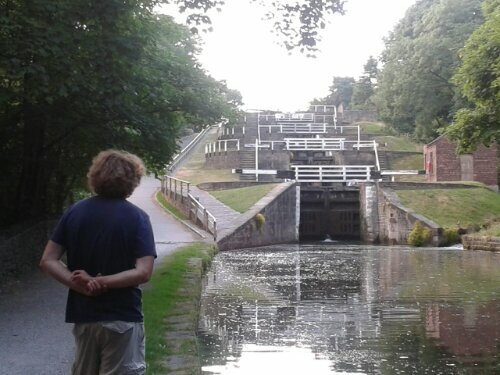 Not just picturesque locks and towering aqueducts, but also other more esoteric locations, perhaps of more interest to the engineer than to the tourist. 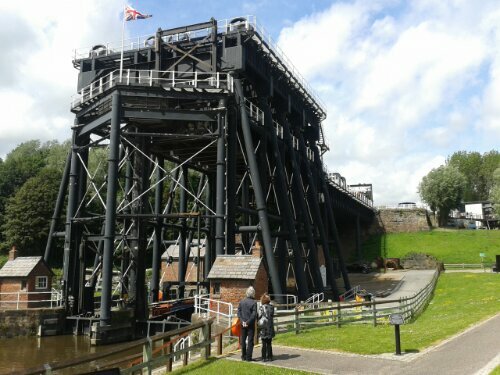 So we were spoilt first up with the Pontcysyllte aqueduct and then the Anderton boat lift: the pyramids of the British waterways, undoubted crowdpleasers, with tourists, trip boats, pubs, and ice cream vans. Then we got onto the difficult third album. 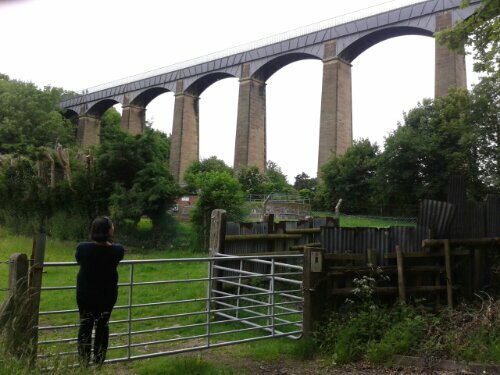 The Barton swing aqueduct is of undoubted majesty and interest, but it doesn’t really open that much anymore, it’s hard to get a good photo, and is over in a few seconds. Probably the Temple of Artemis or some other such Wonder that you had to wikipedia to remember what it was. Likewise the Burnley Embankment: an earthworks of some magnitude for the eighteenth century but nowadays rather underwhelming. And filled with shopping trolleys. So number five, the Bingley Five-Rise, has to be the Hanging Gardens Of Babylon: an intoxicating, tottering tower of masonry, gushing water, great wooden beams, and lush greenery. 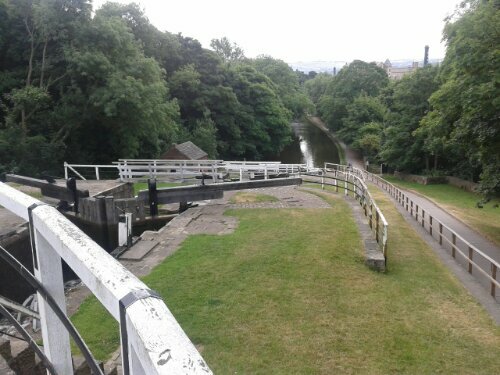 The five-rise is a flight of locks that drop the Leeds & Liverpool Canal down sixty feet towards the Aire valley. 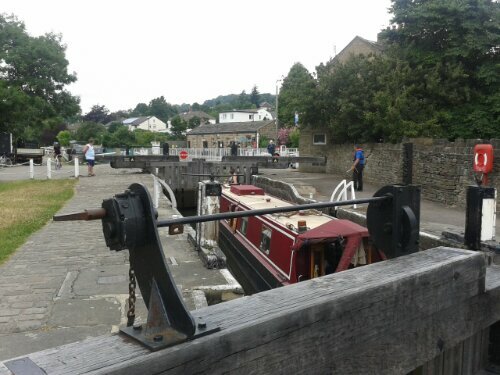 Rather than do this in the conventional manner of a string of locks each separated by a a stretch of canal, this staircase lock dispenses with the intervening bits altogether and telescopes five locks into a single construction. 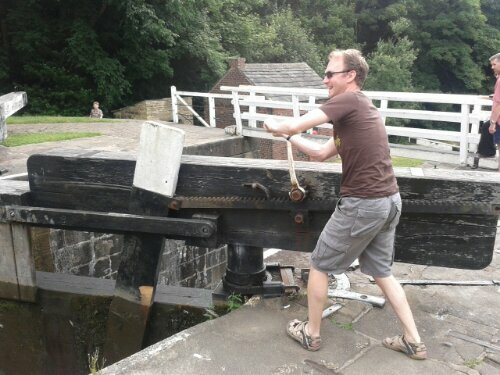 The bottom gates of one lock are therefore the top gates of the next. Each of the five chambers is 60 feet long, 14 feet wide and 12 feet deep. 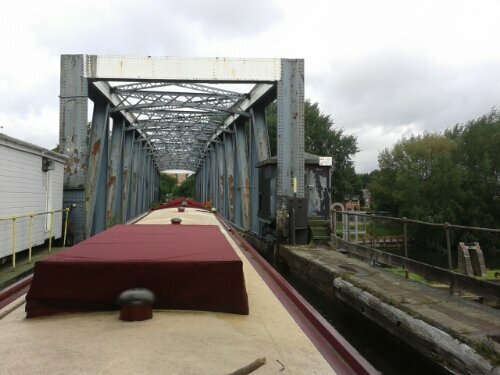 The intervening gates are the largest on the British canal system. The whole thing descends its 60 feet in the space of 300 horizontal feet, a gradient of 20%, akin to an HC Tour de France climb, and the steepest lock flight in Britain. 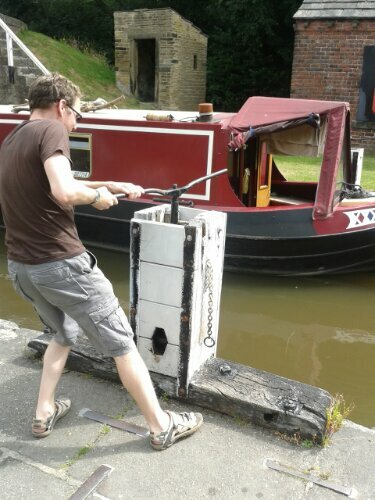 Two massive ground paddles (or sluices) and two antiquated gate paddles are used to shunt the water, and therefore the boat, from one chamber to the next. 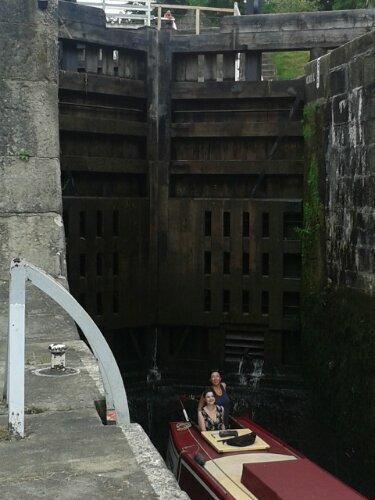 The locks crawl with boaters, tourists, and lock keepers all hurrying about doing their thing. The whole enterprise is bordered on either side by lush green woodland. Watching the boat inch its way down was simply a wonderful experience! Thanks to Charlie for additional muscle work! Gosh, I know where you are again! 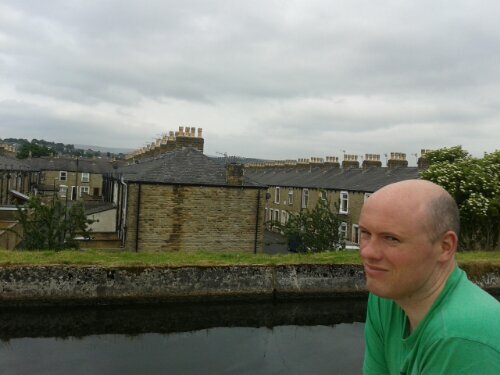 Bingley is where Caroline got married last September. We admired all the barges moored up by East Riddleston Hall (where the reception was)and on the way to the barn we had rented. Very pretty round there …if one ignores Keighly of course.